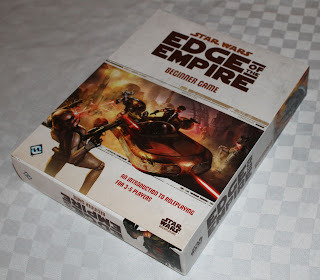 On Thursday the first (outside the beta) of Fantasy Flight Games' Star Wars line made its way into my local FLGS. 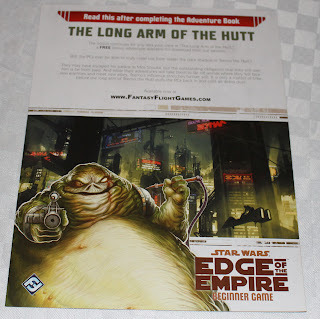 The Star Wars Edge of Empire Beginner Game. 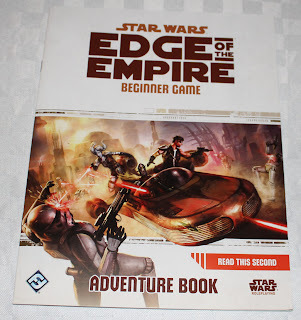 This is a $30 box designed to introduce players to the Star Wars RPG, and perhaps new people into the hobby. It harkens back to the old days of beginner sets for games. It's colourful, simple and contains everything you need for a good few hours of fun. 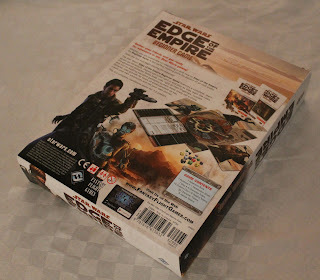 Like many of the Fantasy Flight RPG boxes of late (using Wargammer Fantasy Roleplay as an example) the box isn't entirely filled with the contents. A cardboard sleeve is used to bulk out the box and to contain the dice separately from the flat contents. 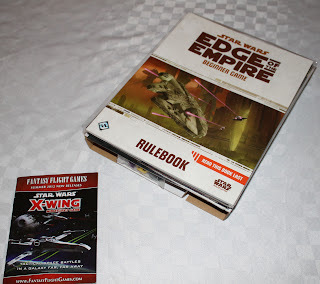 As is normal for a Fantasy Flight box set, we get a copy of their latest catalogue though why it's Summer 2012 I'm not sure. 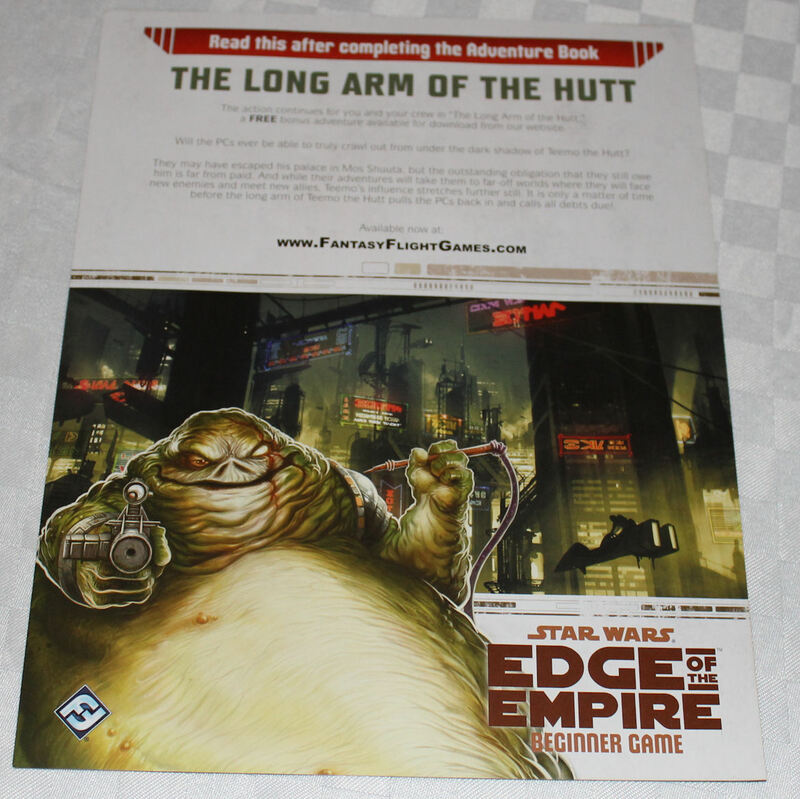 From a game contents perspective we get a main rulebook, emblazoned with the instructions to read this last. 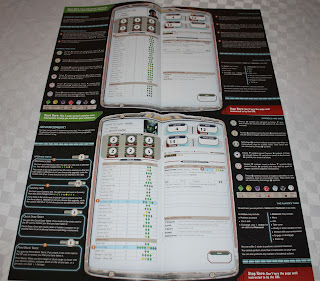 In keeping with its style of being a beginners game, each of the booklets (with the exception of the character folios) contains a notice on the cover indicating the order in which to read them. So despite the fact they were packed in a completely different order I'll go through them in the order they're to be read. First up we have the Introduction Sheet. 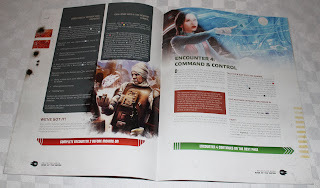 This gives a short overview of what is a roleplaying game for the uninitiated, along with a two page spread of a game sample (we've all seen these before.) 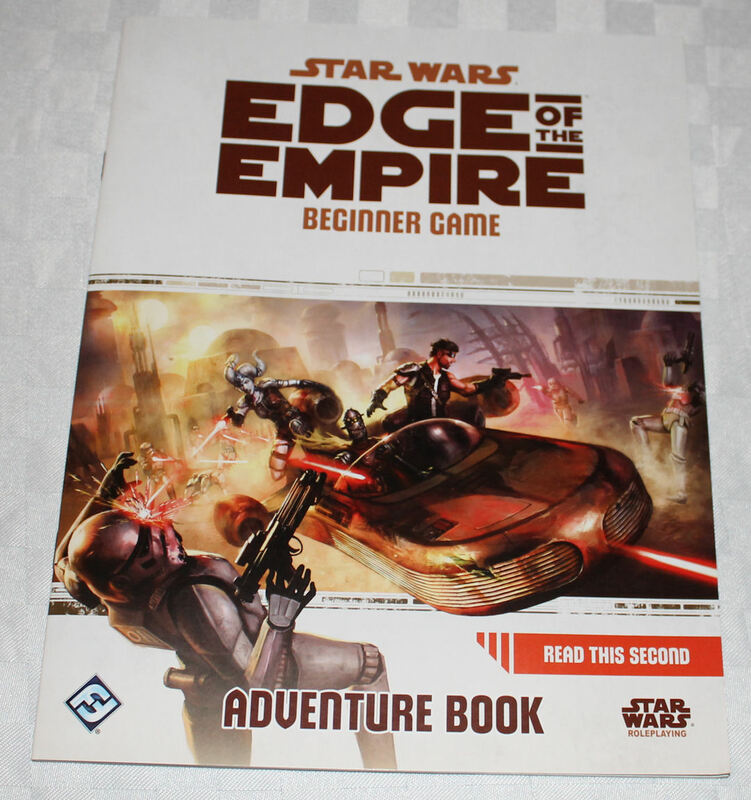 On the back page we have the traditional Star Wars scrolling text that serves as an introduction for the adventure included with the game. The Read Me Second is the Adventure Book. 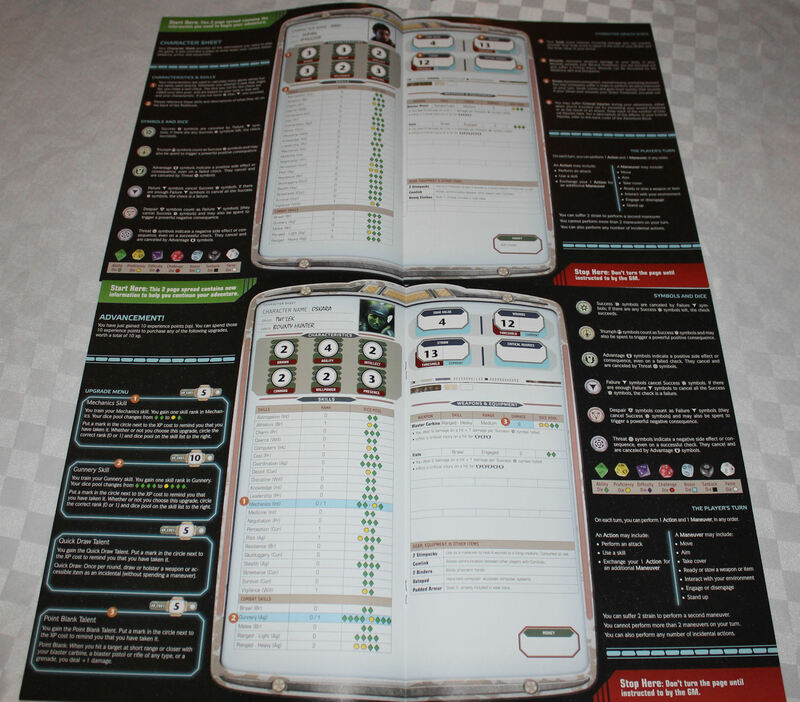 The Adventure Book is a ready to play adventure for the GM. It quite clearly explains the rules as it goes in the areas of the adventure where they will come into play. 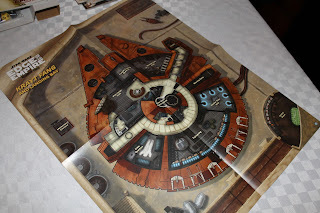 Additionally the adventure contains a lot of suggestions and information for the various paths the players may take during the course, intending to cover as many possibilities as it can. This should help reduce a beginning game masters workload when running a game. Since this is designed as a beginners game it comes with pre-generated characters. There are four in total, each comes as an 8 page full colour character folio. 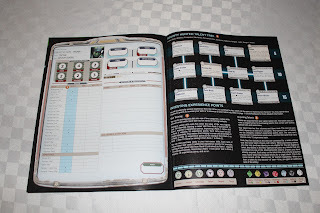 These folios contain all the characters stats, along with details on the rules relevant to the players, information on experience advancement and details on how the dice work. There are four characters. 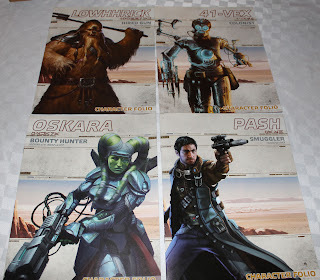 A Twilek Bounty Hunter, a Wookiee hired gun, a human smuggler and a freed droid colonist. Coming up after the Adventure Book there is a two sided flyer. One side is simply an advert for the full game book coming out in Spring 13, and the main side tells the GM to go to the Fantasy Flight website to download a new adventure that continues after the one in the box set. 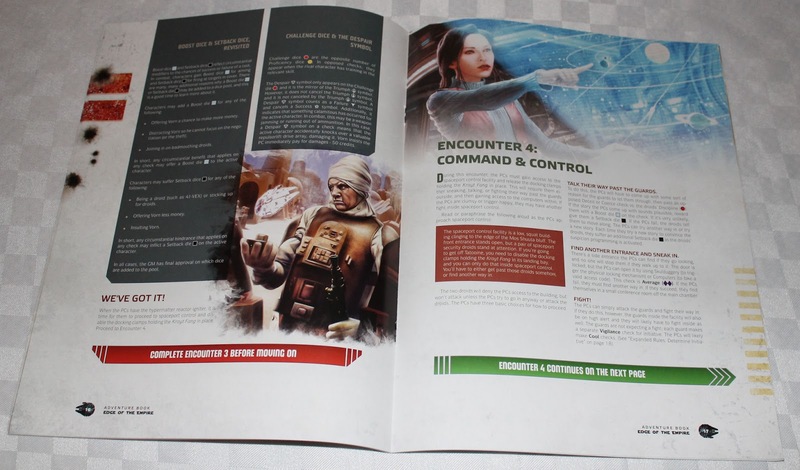 The Final Read Me booklet is the main rulebook (pictured earlier in this article.) 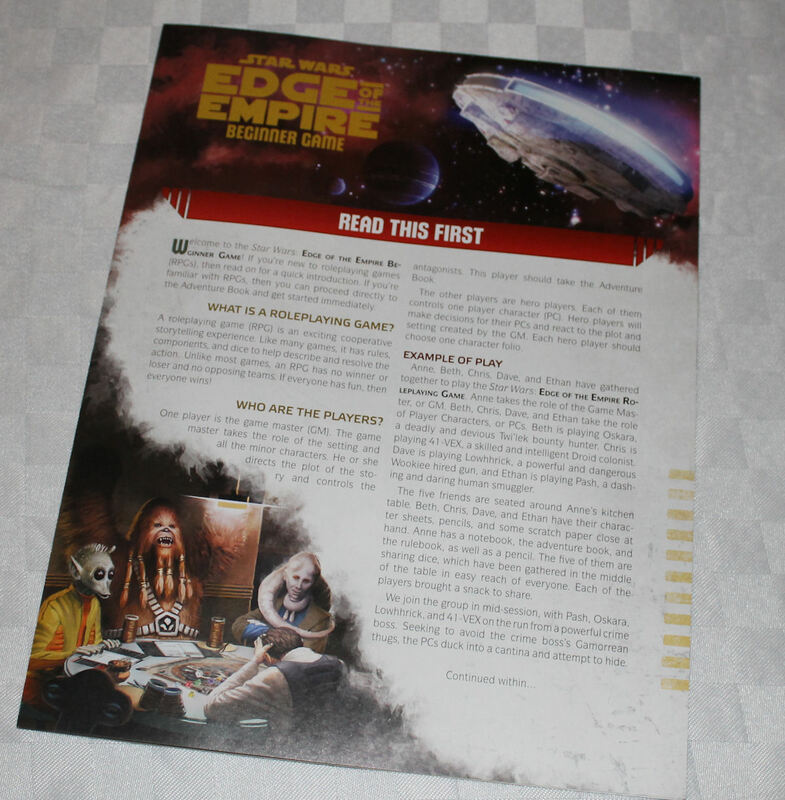 This 48 page book contains the rest of the rules that the players and GM will need to continue more adventures outside of the limited set needed for the introductory adventure. While obviously this won't be as comprehensive as the main book that will come out next year, it seems on a quick skim it should be sufficient for now. Rounding out the box set we have a double sided fold out containing maps. 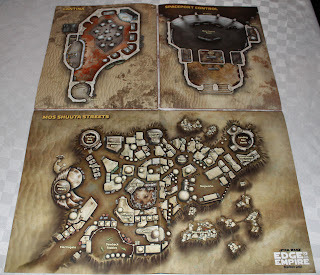 One side of the Krayt Fang, the players spaceship, and the other side of three locations in the adventure. 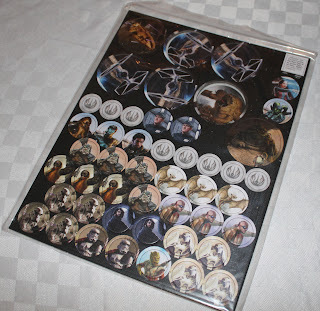 Additionally there is a set of popout counters that are produced to the same high quality as Fantasy Flights normal board games. They represent characters, NPCs, vehicles and starships in the adventure. Rounding out the box are the custom dice for the game. 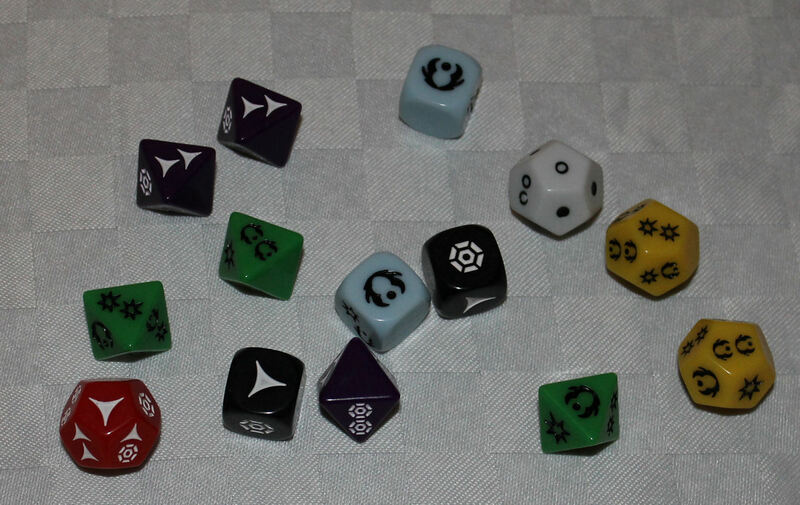 Again, these are high quality dice up to the normal standards. So all in all you get a decent amount for your $30, especially as a beginner set. Looking through this all I would say this is a perfect box set to get for anyone you're trying to introduce to the world of RPGs. Also if you are interested in the game for when it fully comes out next year, this may not be a bad investment though the dice will be available separately at a later point so I wouldn't get it just for them. By the way, do you have any idea of how to use those exotic custom dice?